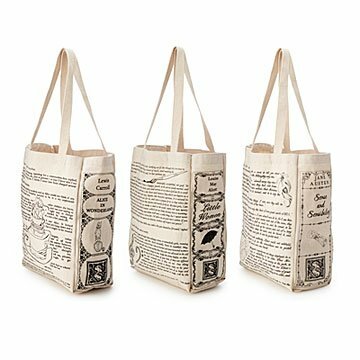 Celebrate classic books while you tote everyday essentials with this bibliophile's bag. Carry everyday essentials, your latest reads, or gear for the big Jane Austen convention in one of Tori Tissel's totes silkscreened with passages and vintage decorations from the classics. They'll inspire you to cheer on the heroines of Little Women, savor the romance of Sense and Sensibility, or take a tumble down the rabbit hole with Alice in Wonderland. Every panel of the 100% cotton denim bags—custom cut and sewn for the design—is a page that will take you back to the magic of these beloved books. They make well-read gifts for any bookish friend or library addict. Handmade in Portland, Oregon. Fashion designer and book lover Tori Tissell fuses both into her work with fashionable flair in her Portland, Oregon, studio. She received her degree in fashion design from Pratt Institute in Brooklyn, and after being stumped for gift ideas one holiday season, she decided to use her education and passion for screen printing, fashion, and literature to create something memorable for family and friends. The result was a flowing scarf that resembled the pages of a book. Each of her bookish accessories provides a window into a world of storybook magic. Get wrapped up in Tori's story on our blog. Gentle wash cycle in cool water.